If right here and now, I proclaim the 2018 BMW X3 M40i to be the bare minimum of what it is to be a sporty crossover, then maybe the SUV/crossover apocalypse can be slightly more tolerable. I know, I know: BMW’s M-line is the one that typically steals all the spotlight. There currently isn’t an X3 M, so the X3 M40i is the highest you can go. The thing is, though, just because it’s not tuned to maximum attack, that doesn’t mean it’s any less capable. Or worth your attention, if you’re picking through the market for one of these things. If SUVs and crossovers are truly taking over the world, then this is the way I’d have them all. Among the vast family of SUVs and crossovers that BMW currently offers (six Series at the time of this writing, each with their own variations), the X3 is the medium-sized one. Not as petite as the X1 and not as massive as the X6. And the M40i part of its name designates the turbocharged, 3.0-liter straight-six engine. There is no X3 M, so the X3 M40i is the highest you can go. I first experienced this wonderful engine in the M240i Coupe. It was raspy and torquey and all sorts of fun. Would it offer the same amount of joy in a bigger, heavier body? I went to find out. Weighing in at over 4,200 pounds, the X3 M40i is tuned to have 355 horsepower and 369 lb-ft of torque. All of that is mated to an eight-speed auto. BMW claims that it’ll hit sixty from rest in 4.6 seconds, with a top speed of 155 mph. It has all-wheel drive and even a launch control feature. Why you would need launch control in a car that will probably spend most of its life rolling through Costco parking lots is beyond me, but it’s there. There’s no getting around the fact that a crossover is more spacious inside than sedans, wagons or coupes. As I had just returned the 2 Series and do not typically drive crossovers, the amount of headroom in the X3 M40i was startling at first. The car’s windows are nice and big and the roof is high. From the outside, it looks kind of absurd, but on the inside, you can see nearly everything on the road. New cars are getting harder and harder to see out of due to rising belt lines and the like, and it doesn’t help that some crossovers favor the “coupe” silhouette—a design decision I find to be highly flawed because it shrinks the rear window to the size of a pinhole and seeing out of it is nearly impossible. The X3 M40i suffers from no such design silliness. BMW took a basic crossver shape and went with it. I wouldn’t call it an attractive car, but at least it’s not pretending to be something it isn’t. And because it’s a crossover, it fits loads of stuff and people in it. At least 17 people, four Bernese mountain dogs and enough gear for a NASCAR tailgate. This is a professional estimate. I was afraid that the steering would be vague and too light and I was right. I think properly weighted and calibrated steering is important to have in all cars, but especially so when applied to a large, lumbering crossover. With its eerily too-light steering, the X3 M40i felt like exactly that: Lumbering. Putting the car into Sport mode alleviated the issue somewhat, but it was just another matter of adding weight to the steering instead of increasing responsiveness. Overall, the steering was floaty and vague. It’s definitely not the kind of steering you want with a big car—it feels so disconnected because it’s so light and the front of the car is so big. Since most Americans use their cars to commute to work and run errands, I am happy to report that the X3 M40i is perfectly agreeable to sitting in traffic and trundling around local roads whose speed limits do not exceed 35 mph. You don’t ever feel like the car is mad at the low speeds and the constant stopping. The high ride gives you a good vantage point over whatever’s in front of you. And because the X3 M40i is armed with BMW’s excellent 360-degree camera system, parking it is a breeze, too. I could only find four small blind spots, and those were at the corners of the car. But, paired with good, old-fashioned looking, there isn’t much that you won’t see. Lean into the throttle, especially when the car is in Sport mode, and you’ll get the same lovely, raspy straight-six howl I enjoyed so much in the 2 Series. The acceleration didn’t feel as aggressive as the smaller car’s did (because there is so much more car to move), but the X3 gets going quickly for something so large. The gearbox isn’t so eager to kick up a gear when in Sport mode, so the revs stay higher for longer, egging you on. It’s a great feeling—some real encouragement for you to gas it more. In fact, the X3 M40i responds well to a bit of caning. As well as it does slow, it does sporty, too. Obviously, you can’t drive it like the M240i—don’t corner as hard, don’t stop as short—but the chassis is well-balanced in the turns. It’s perfect for a bit of light back-road carving or aggressive highway merges. 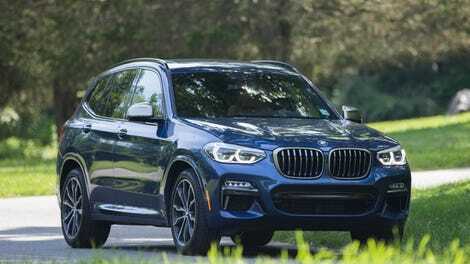 The MSRP for the X3 M40i comes to $54,300, but with options like the adaptive M suspension and the assistance, premium and executive packages, the price of my loaner came to $65,045. That’s about the price you’d pay for a Porsche Macan S. The two are nearly identical in power, too. Perhaps the BMW will depreciate more quickly than the Porsche over time. But if that kind of thing doesn’t bother you and you just want a spacious and capable crossover that has a little punch to it, then the X3 M40i is your car. No, the X3 M40i isn’t an M car, although it does wear 15 ///M badges. I counted them. Arguably, that’s too many badges, but I’ve heard the more your car wears, the more horsepower it has. Can’t confirm whether or not this is true, though. With the X3 M40i as punchy and pleasantly enjoyable as it is, I just can’t imagine that its lesser flavors, the X3 sDrive 30i and the X3 xDrive30i, are as interesting or fun. If you’re going to market something as an athletic crossover, then it had better sound nice and have some pickup to it. Otherwise you’re just driving around in vehicular anesthesia with higher ground clearance. 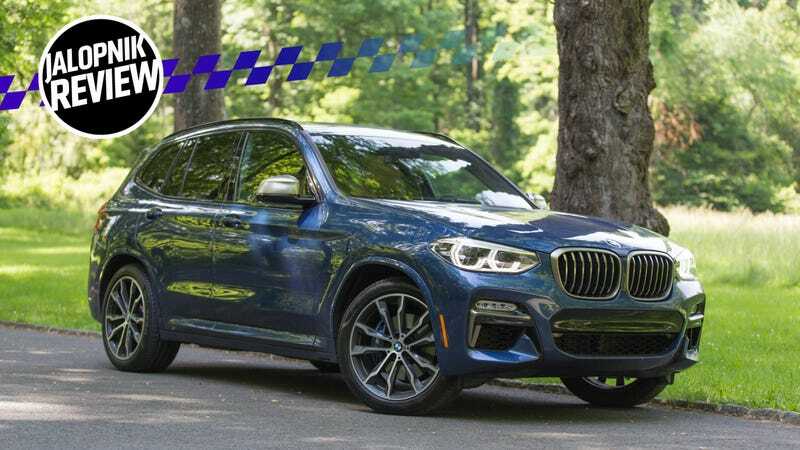 The X3 M40i is for the people who either want or need the extra crossover space but also appreciate something that will get to the junior league soccer game more quickly than all the other moms and dads. It’s perfectly happy doing the boring stuff, it’s just also nice that you have the option of having some excitement. It is the bare minimum of what a performance crossover should be. Anything less is humdrum, dull and pedestrian. You can sleep when you’re dead.